29 Dec MAISON MK. Creative cuisine. Maison MK ,Creative cuisine mix Moroccan and French dishes. Riad Aguaviva recommend this restaurant for refinated gourmets. 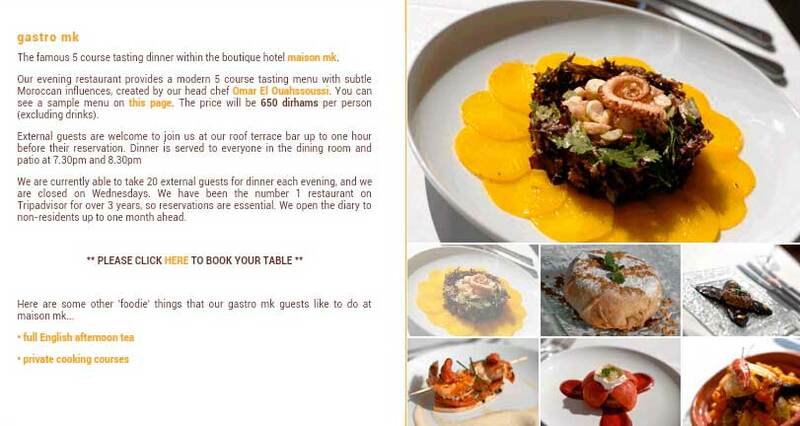 “Refined and very trendy, it has combined as one the tradition of Moroccan cuisine with modern French cuisine. At noon, it serves lunch on the terrace about 15 euros plate, with proposals such as smoked salmon, marinated skewers, battered red mullet or mint pannacotta. However, it really worth the MAISON MK is taste tasting menu at nightfall. The feast includes appetizers, cream of broccoli soup with blue cheese, chicken with almonds accompanied by salad with quail eggs, pumpkin puree and apricot sauce, duck leg confit with nuts, potatoes, carrots and crunchy foie gras sauce, iced mint and carrot and apple pie with vanilla ice cream and caramel syrup. “Having spent almost 10 days in Marrakesh and tried many of the top restaurants I think Gastro MK is very deserving of its No 1 rating. I booked in Maison MK this weeks beforehand by email as a Christmas present for my husband and it was even better than expected. The terrace is a really lovely experience -best views we have seen so far. Lovely blankets offered for the light chill air. Tasty canapés that set the evening off to a great start. Throughout the evening we had tantalising tastes and wonderful textures. The MK service is impeccable but warm and friendly. The Riad itself is beautiful and very tastefully decorated. From start to finish it really was a wonderful evening and experience. “I’m amazed that this is rated as the best in Marrakech – it’s average at best. And a bit weird. Tries too hard to be modern cuisine, and mixes flavours and textures seemingly randomly. The night we were there tasteless salmon with overpowering beetroot….undercooked and poor quality fillet of beef with carved vegetables…sent back and replaced by (admittedly) very nice sea bass… And a trio of desserts ranging from one nice to one average to another (green fluid) which was basically snot. We were visiting Marrakech over Christmas, picked what was a highly rated restaurant but I am a sceptic when it comes to places that are awarded the best place as they never seem to live up to expectation. From the time we arrived the manageress was very charming and made sure we had our needs catered to.The roof terrace was very lovely but once you’ve seen one roof top terrace in Marrakech you’ve almost seen them all. The Maison MK service was exceptional ,and the waiting staff are very helpful. We dined from the sample menu and the food was good particularly the cauliflower and saffron veloute. All round pleasant experience, next time I am in Marrakech will certainly stop by for afternoon tea”. 14 Derb Sebaai , L’ksour, Marrakech medina.